Monument Valley is the place where God put the West. John Wayne, American Actor, circa 1950. Post card from the 1950s, part of a series celebrating the icons of the United States. 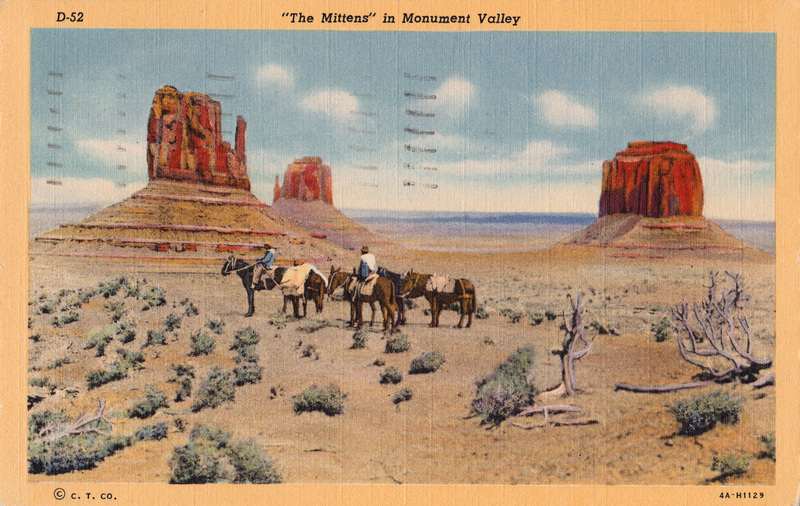 This scene of the Mittens and Merrick Butte in Monument Valley defined the American West for a generation. The Monument Valley ultras follow a course around these iconic sandstone buttes. Click on photos for large versions. 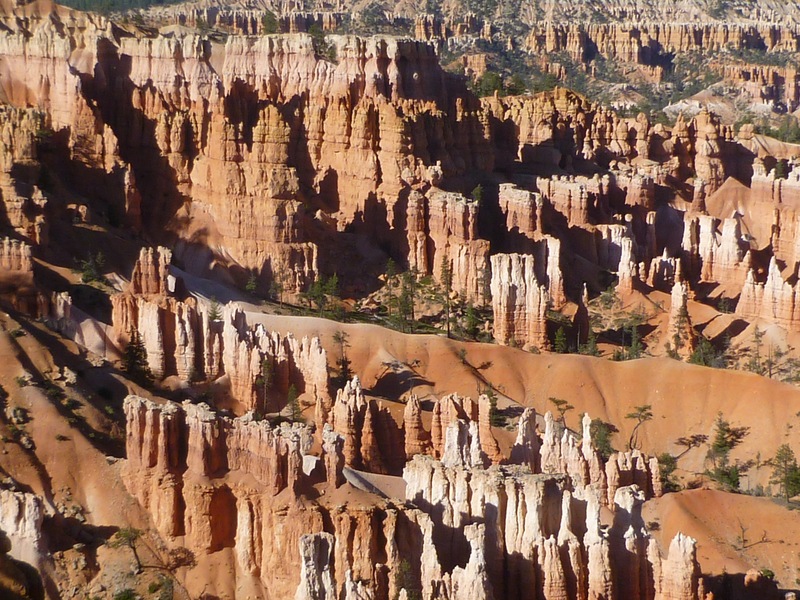 The southern half of the Colorado Plateau stretches from Lake Meade in the west, to Cuba, New Mexico in the east, and is a stunning desert highland of pastel colored bluffs, and exotic wind sculpted rocks. The land is both beautiful and desolate; in more than 80,000 square miles there are only 250,000 inhabitants (more people live around Lake Meade and Flagstaff that the rest of the southern plateau combined), but there are 10 National Parks and 17 National Monuments, 10 Wilderness areas, along with another half dozen parks in the Navajo Nation. It is also the land that American geologists wandered in the 1860-1880s and their observations shaped modern thoughts about geologic time and the extraordinary patient, but always persistent, force of erosion which eventually grinds even the highest mountains to dust. John Wesley Powell navigated the Colorado River through the Grand Canyon and Clarence Dutton mapped the geology with remarkable insight; these geologic giants were the vanguard of the American contribution of “the second age of discovery” that transformed the mystery of nature into a science. I love visiting these desert lands; in a crowded and noisy world the Colorado Plateau imposes it’s will of solitude and reminds one of man’s temporary significance. 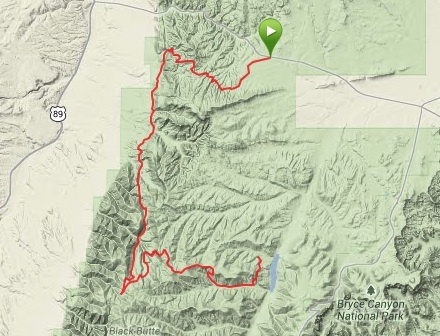 Ulta Adventures runs a series of ultra runs across the southern Colorado Plateau that they call the Grand Circle. 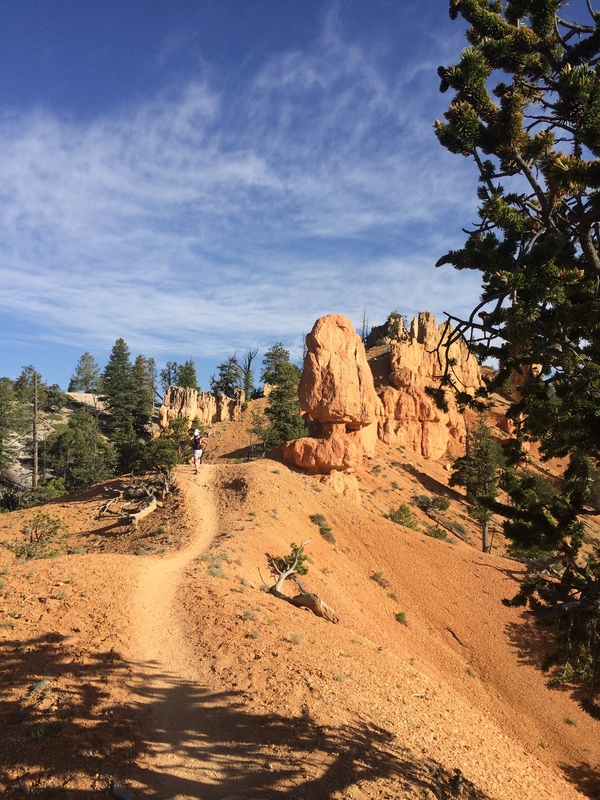 Last year I ran the Ultra Adventures Bryce Canyon 50k – and it was a spectacular run! The geology was great, the UA staff are wonderful, and course was challenging. This year I decided I wanted to run the UA ultra in Monument Valley held in mid-March. 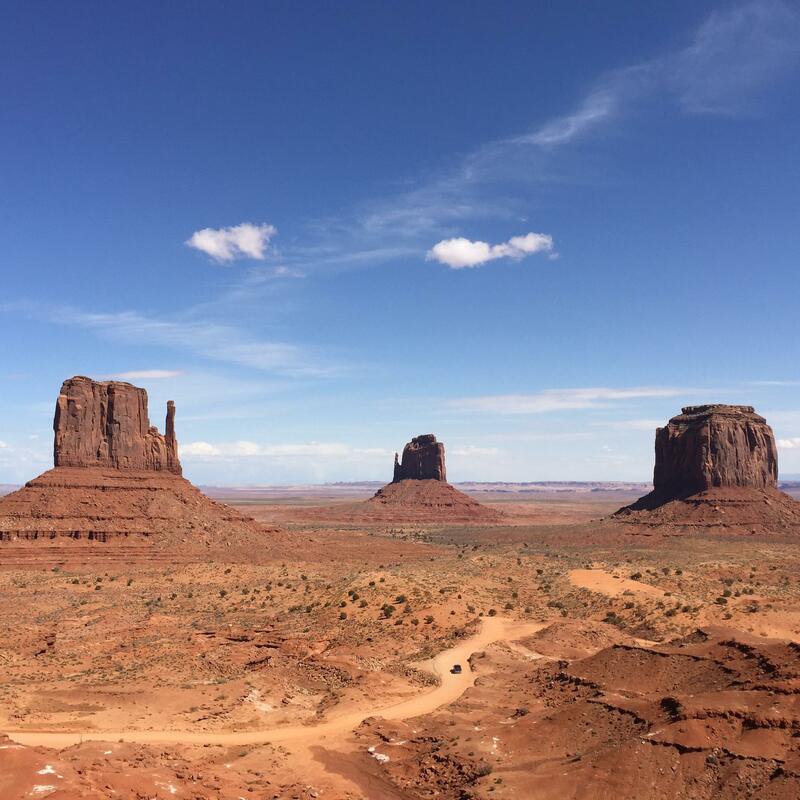 No other piece of real-estate has defined the American psyche of “the old west” than Monument Valley. You would be hard pressed to find any baby boomer that would not immediately recognize the “Mittens” — sandstone bluffs in Monument Valley — as the movie backdrop to scores of films. 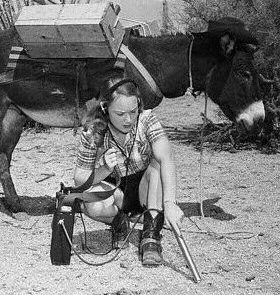 Scene from the 1939 production of the film Stagecoach. John Wayne played the Ringo Kid – a criminal that makes good, vanquishes the real bad guys, and of course, gets the girl. Monument Valley is a tract of canyon lands located about 100 km west of the Four Corners along the Utah-Arizona border. 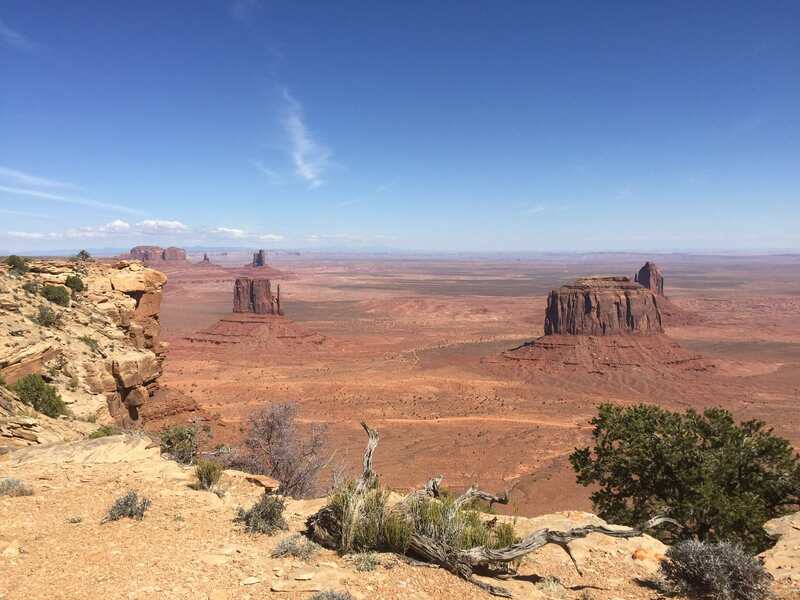 Within the valley there is a 140 square mile park – the Navajo Nation’s Monument Valley Park — that was “discovered” by film director John Ford in 1939 with the release of the classic western Stagecoach. 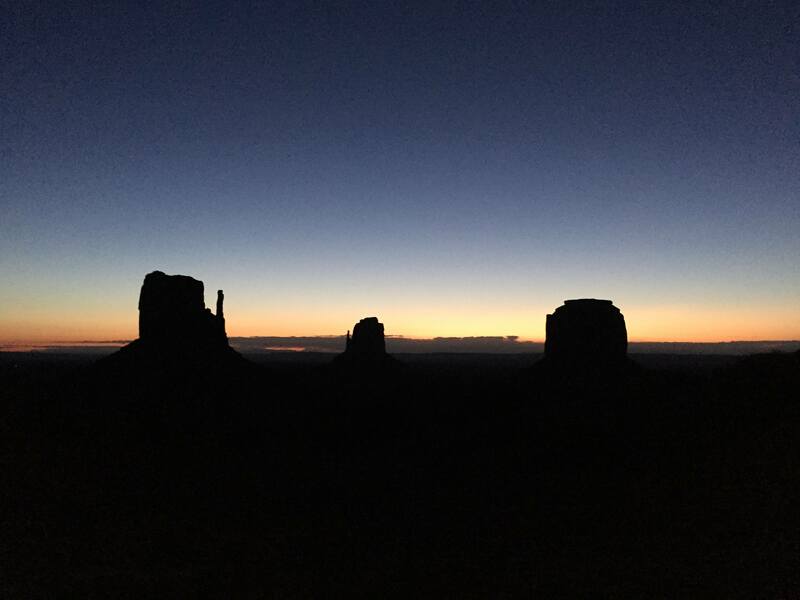 Ford chose Monument Valley because, to his mind, the desolation and isolation of the bluffs and red sandstone captured the essence of the hardscrabble life of the wild west. Ford cast John Wayne as the Ringo Kid, a gunslinger. This roll is largely credited with making Wayne a film superstar – and forever he is pictured across from the Mittens. 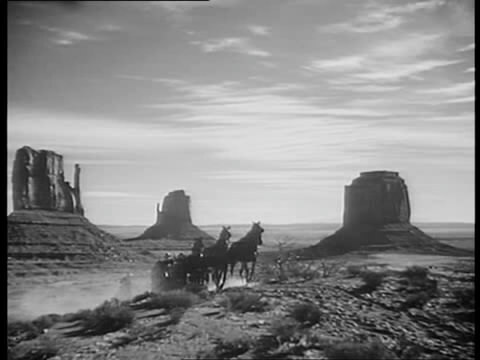 There is a creation myth about how John Ford found Monument Valley — it starts with Harry Goulding, a sheep herder and owner of a trading post in Monument Valley packing up and heading to Hollywood with photographs of the scenery as an act of desperation during the crushing poverty of the great depression. Goulding showed up at Ford’s offices and somehow, against all logic, convinced Ford that he should film his upcoming western in the corner of Arizona that was hundreds of miles from the nearest train station and only accessible by a dicey dirt road. 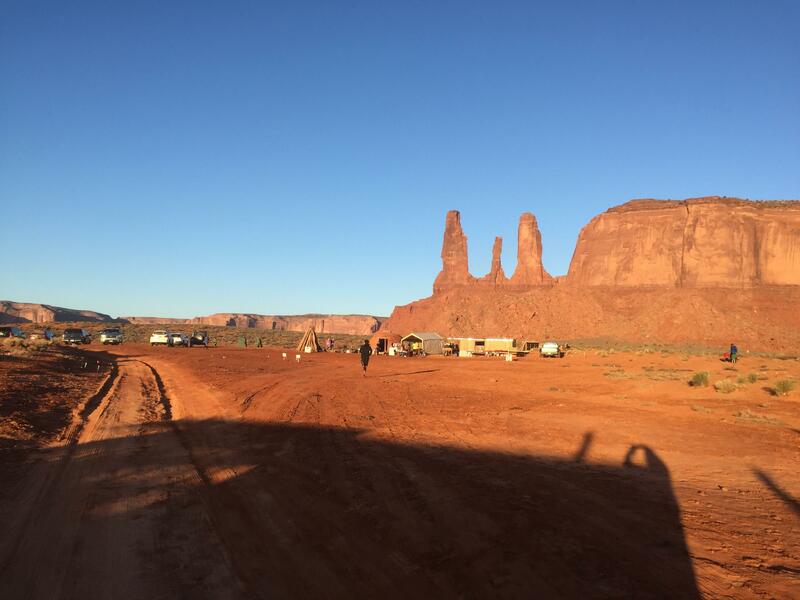 Ford eventually filmed parts of 6 of his most famous movies there; other directors followed, and Monument Valley has appeared in more than 100 movies! 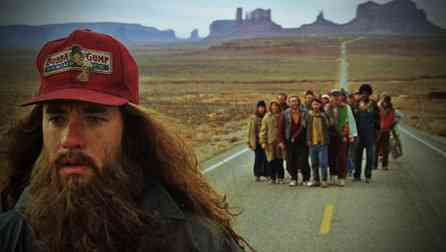 Forrest Gump ends his epic run back and fore across the US at Monument Valley. This scene, as Forrest stops, and his followers are baffled, was shot on Hiway 163 looking south to the bluffs of Monument Valley. It is only appropriate that the rich movie heritage of Monument Valley would collide with ultra runs. The 1994 movie Forrest Gump is the tale of a man’s life that serendipitously criss-crosses 40 years of tremulous American history. I saw the movie in Flagstaff, Arizona when my wife was working on the geodetics of volcanoes at the USGS field office – we loved the movie and it remains one our top ten favorites ever. In the movie, Forrest starts running on October 1, 1979 to ease the pain of rejection by his true love. He ends up running for 3 years, 2 months, 14 days and 16 hours, and covered 15,248 miles (crossing America at least 4 times) – no ultra runner has ever equaled the trail brazed by Forrest. 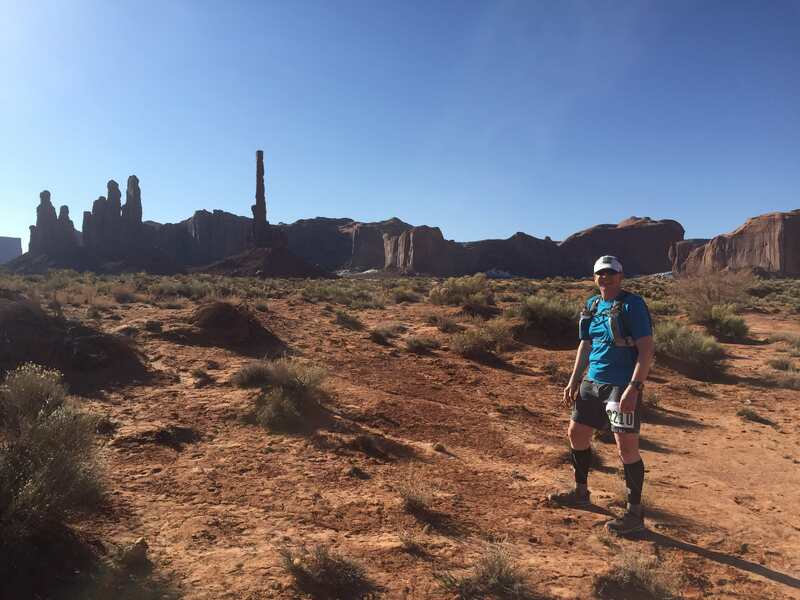 Forrest ended his run at Monument Valley – he just stopped, and decided the run was over, and it was time to go home. What a perfect setting for an ultra run; geology, history, and the termination point for the greatest ultra run ever. View from the start of the race — the day before. The west entrance to Monument Valley is guarded by three erosional remnants. From the left, West Mitten, East Mitten and Merrick Butte. Running on Ancient Sand Dunes Monument Valley refers to a large swath of landscape along the Arizona-Utah border, but most people associate the name with a modest 3 by 5 mile drainage basin. This basin stretches from the world famous Mittens in the north to Wetherill and Hunts Mesas in the south. The name “Monument Valley” first showed up on maps in 1917. Who exactly was responsible for that moniker is lost to history, but the name is appropriately descriptive; the view down the valley is filled with monoliths and buttes that are the erosional remnants of a thick layered cake of sedimentary rocks that were deposited by water and wind nearly 200 million years ago. The Navajo name for the valley is Tse’Bii’Ndzisgaii, which translates approximately to Valley of the Rocks (at least my Navajo friend tells me this – others have slight variations). Satellite image of Monument Valley. 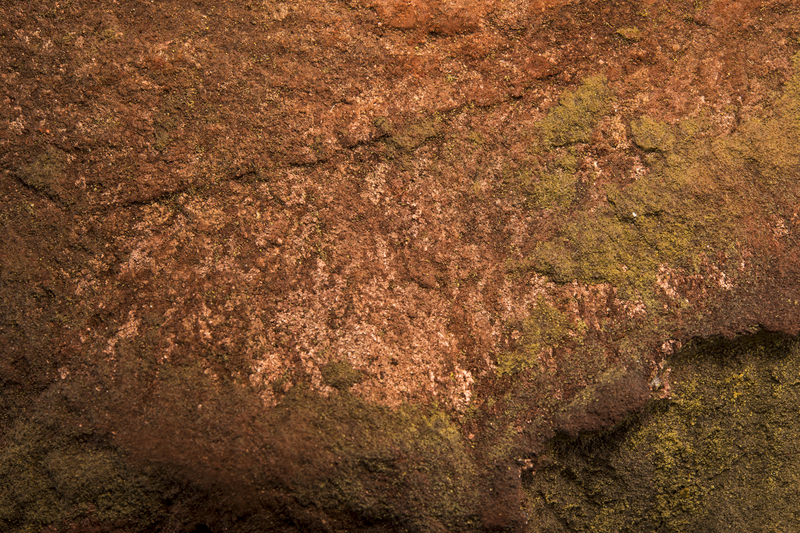 This is not a false color image – the land is reds and browns, colored by the strained sedimentary rocks that were deposited on an ancient continent during Permian times. 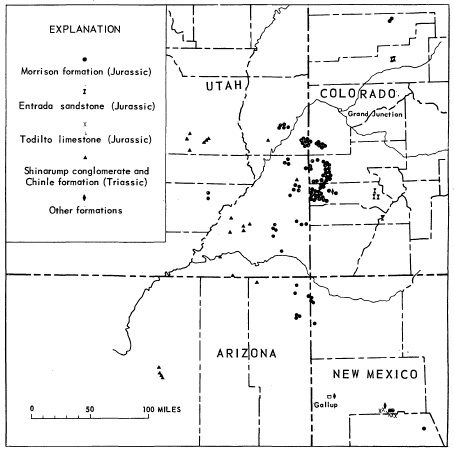 The Colorado Plateau is one of the most unique geologic provinces on the globe. A huge, broad plain or basin was formed at the margin of the primal landmass that today we call the North American Continent. This “basin” captured the cobbles and shards that resulted from the erosion of the ancient continent. 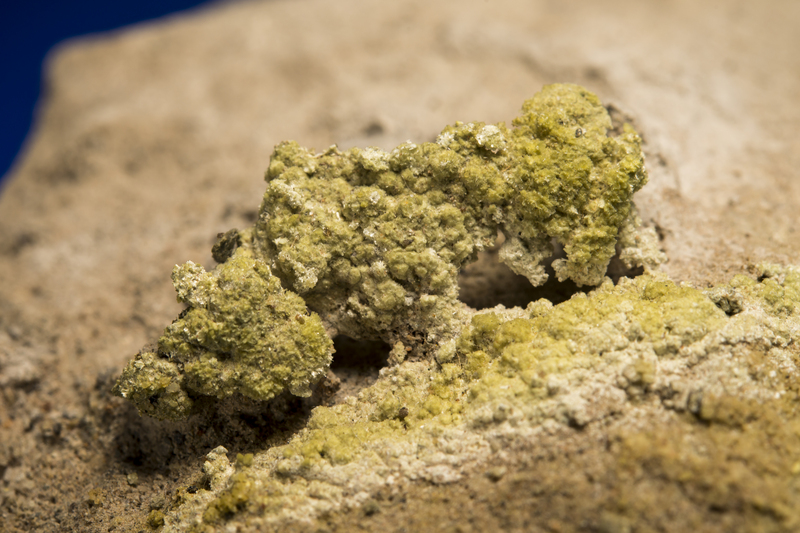 Sometimes the basin was beneath a shallow sea filled with corral reefs and marine life. Other times it was at the edge of an uplifted and rejuvenated continent and was covered by a system of deltas cut by meandering rivers – not unlike the Mississippi delta today. Still other times it was a massive wasteland covered by sand dunes. 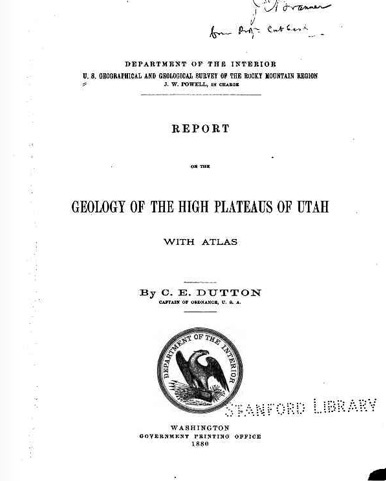 Over a period of 500 million years this broad area we now call the Plateau accumulated a lithic layer cake; thousands of feet of alternating sandstones, limestones, shales and conglomerates. 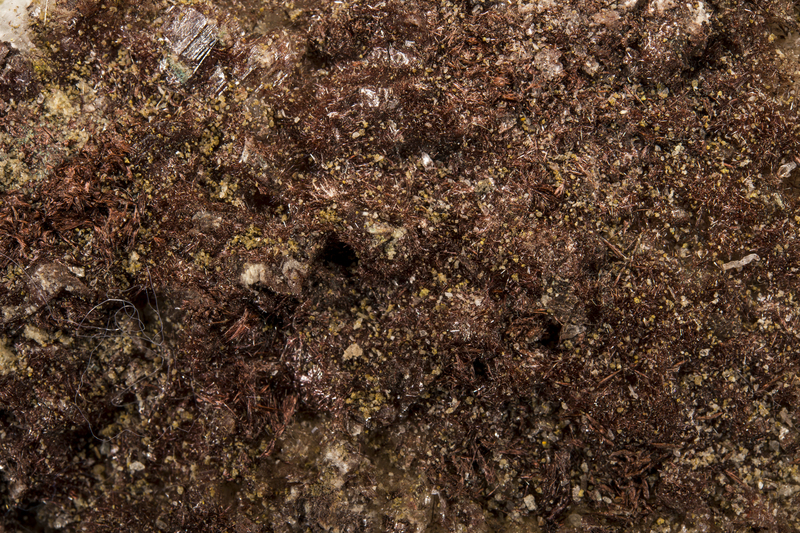 About 20 million years ago this layered rock cake was uplifted, and subjected to the same erosional forces – wind, water and ice – that had ground ancient mountain ranges to dust. The stratigraphy of Monument Valley laid bare in Merrick Butte. The lower apron is the Organ Rock Shale, which gives the Valley the ubiquitous red dust. The steep cliffs are the sandstones from the DeChelly formation, and the butte is topped by the Shinarump conglomerate. The slice of this great lithic cake that is exposed in Monument Valley dates from the Permian Age. The rocks exposed on the Valley floor are the oldest – and are known as the Organ Rock shale (about 280 million years old). 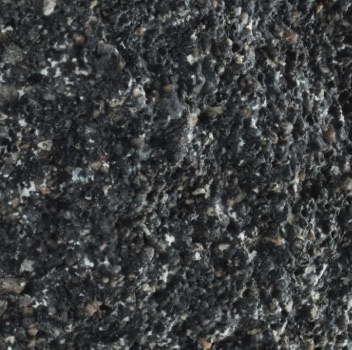 This shale was deposited as muddy clays in deltas and swamps. Above the shale is the rock that builds the monuments, the DeChelly sandstone. 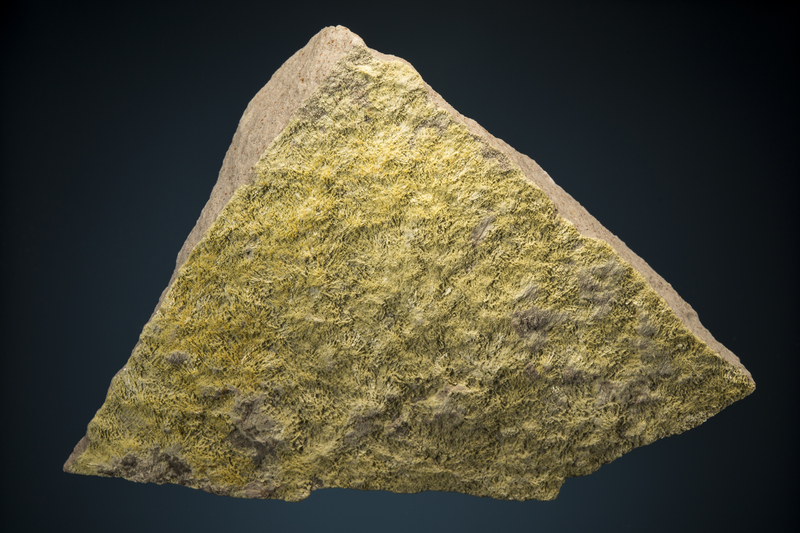 The DeChelly is an amazing rock – it is a nearly pure quartz grain sandstone, that is tough and strong, and can maintain vertical cliff faces hundreds of feet high. The DeChelly was formed from wind blown sand dunes. The modern day analogy for these type of sand dunes is the Namib Desert along the southwestern coast of Africa. 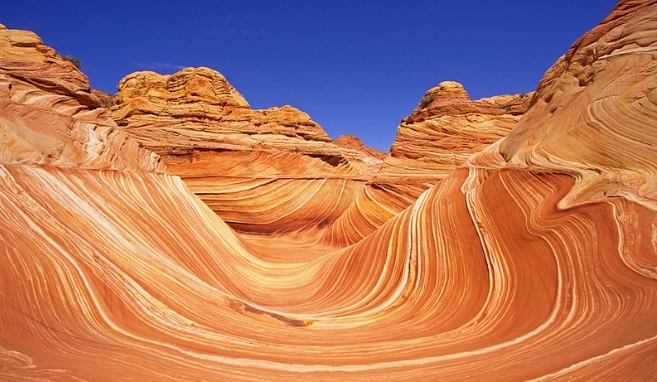 The desert that made the DeChelly sandstone was long lived — probably 25 million years of blowing dunes. Finally, that desert yielded to a more hospitable environment and rivers returned depositing sandstones and shales, which we call the Moenkopi formation. About 230 million years ago the last of the rocks exposed at Monument Valley were deposited on top of the Moenkopi, the hard cobbles and boulders of the Shinarump conglomerate. 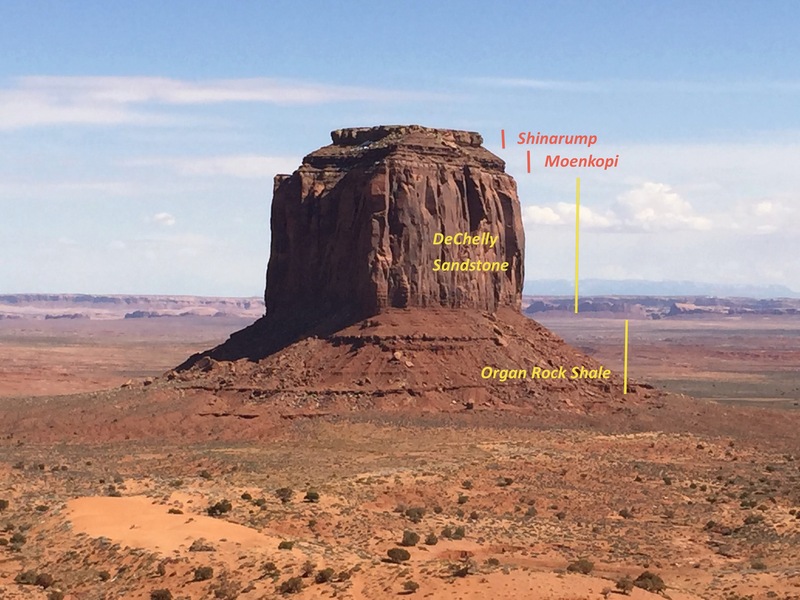 The Shinarump is the “cap stone” on the mesa in Monument Valley, and reason that the softer rocks below have not completely eroded away. The landscape of Monument Valley today is only a shadow of what it most have been a few million years ago. In a few more million years, there will be no sign of DeChelly sandstone, and all the steep cliffs will have been reduced to rubble. 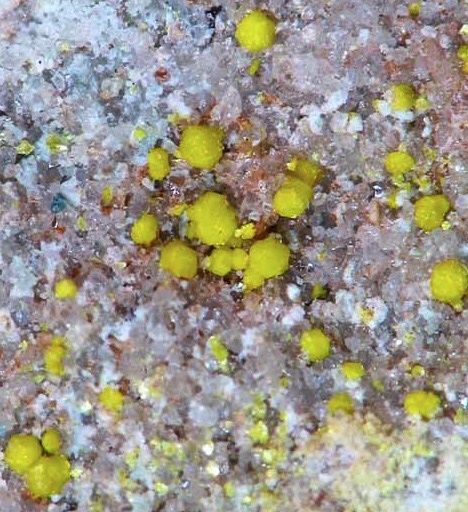 The unique monuments are a result of the layered cake geology; the Shinarump conglomerate is a difficult rock to erode, and for millions of years protected the “softer” rocks below. However, joints and zones of weakness in the Shinarump eventually yielded to the relentless rains, frost, wind and gravity, and began to erode forming small washes exposing the DeChelly sandstone below. The DeChelly is relatively easily eroded, but forms steep cliff faces, making for spectacular canyons. Eventually these canyons cut down to the soft Organ Rock shale which is rapidly washed away. The canyons then begin to undercut the DeChelly, and the stout sandstone collapsed in rock falls and avalanches. 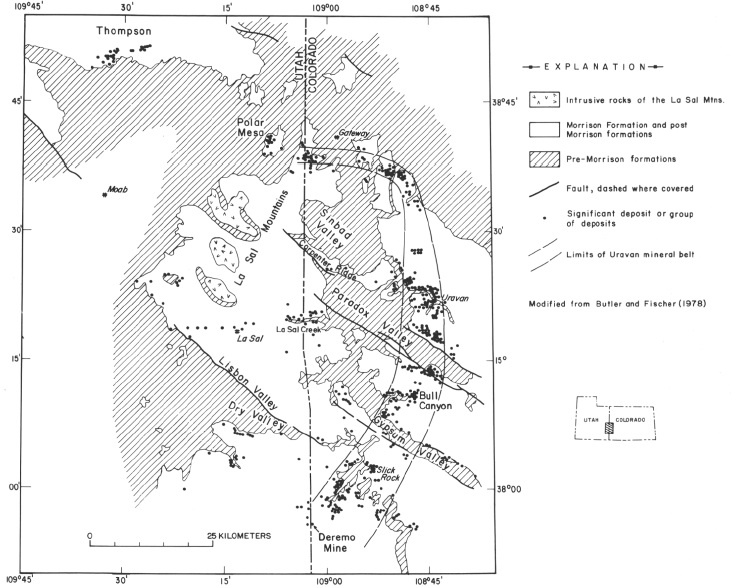 What is left are isolated buttes, mesas, and rock towers. 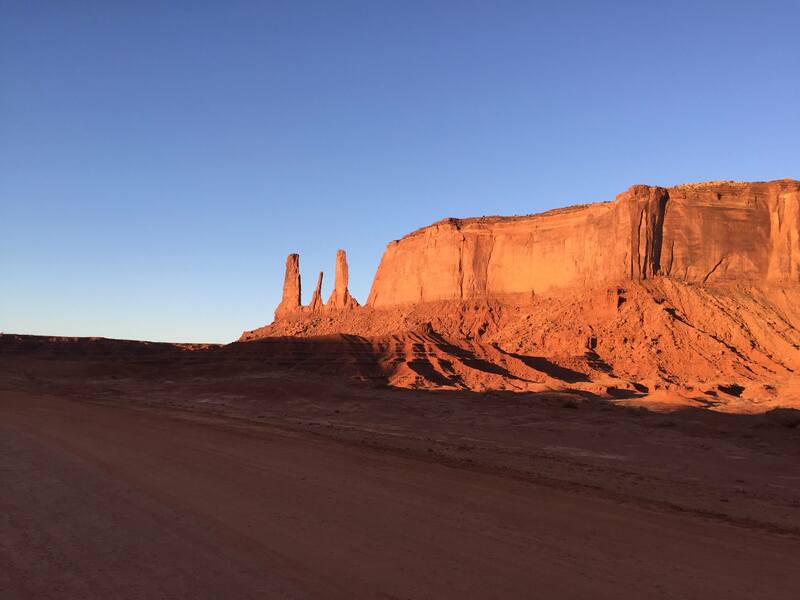 When you run through Monument Valley your view is one of the distant past. The vertical cliffs demand your attention; they tell a story of time when huge sand dunes moved slowly across the edge of a continent. 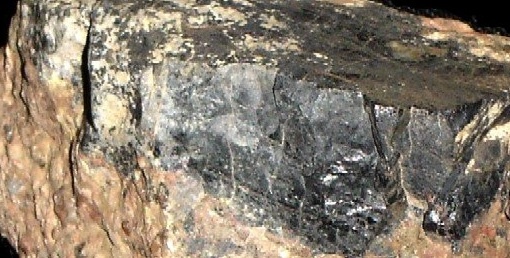 There not many fossilized bones in the DeChelly, but there are numerous fossilized track ways of Permain Age creatures (both vertebrate and invertebrate). The ultra runner today may find the course difficult, but the arthropod racers of 260 million years ago had it much worse. Sunrise over the Mittens, moments before the start of the race. The runners started the run with a traditional Navajo prayer, facing east to the rising sun and the start of a new day. Race Day The Monument Valley Ultras — 100 miles, 50 miles and 55 km — all start near the Monument Valley visitor center that sits on the lip of a small cliff overlooking the iconic Mittens. The runners gathered at 6:45 am for a traditional Navajo prayer welcoming the new day. The prayer, the approaching sun rise, a perfect temperature of 39 degrees, and the energy of the runners creates an emotional aura. Two weeks before the race, Monument Valley received a record snow fall during a late season storm. There was some question as to whether the race would follow the traditional course as flooding from the melting storm closed much of the Valley. 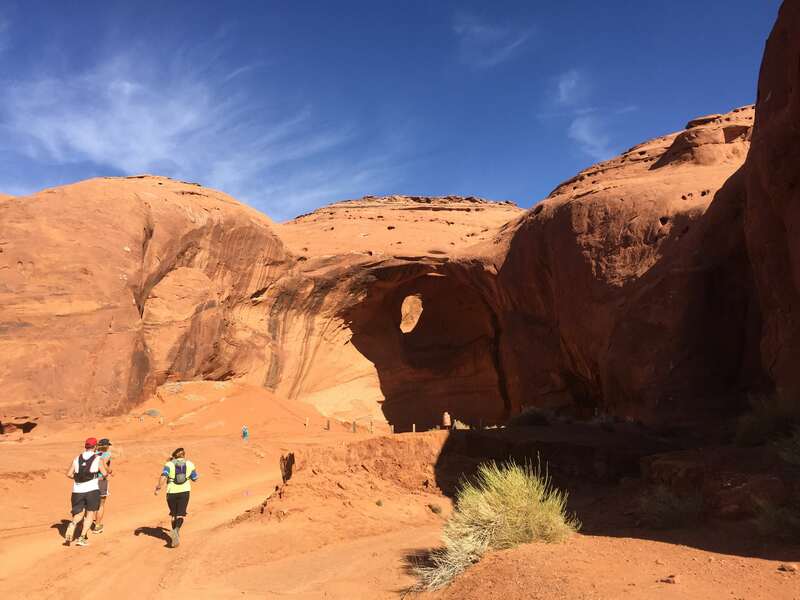 However, everything reopened days before the race; the 55 km course followed a quick descent along a sweet single track that looped around the West Mitten before joining the main Monument Valley tour road. For the first couple of miles I run a pace of about 9;45 minutes per mile – a little faster than I want given the long day ahead, but there never is any way to calm the emotion! 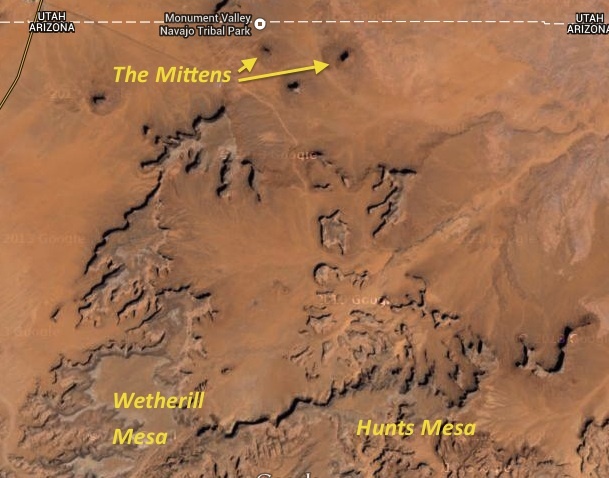 One of the biggest surprises to to me in the first couple of miles is seeing the Mittens from all angles. Although they look like large buttes, they are actually very thin monuments. Viewed from the start of the race the West Mitten is a couple of hundred meters across, but when I pass the western extreme I see that the West Mitten is only a few 10s of meters wide. Although the race started in the glow of pre-sunrise, soon the sun is lighting up the cliffs of DeChelly sandstone. The reds and browns glow – the promise for a great run. The rising sun lights up Mitchell Mesa – the runners will have to climb that Mesa later in the day. Picture is from the main Monument Valley tour road, about 3.5 miles into the run. There are a few tour vans on the Valley road, and tourists are busy taking pictures in the early morning light. I roll into the main aid station, called Hogan, at 58 minutes. The total distance covered is 5.75 miles, so I am feeling pretty good. The 55 km course is shaped like a 4-leafed clover with the Hogan aid station at the center – I will pass through it four times today. 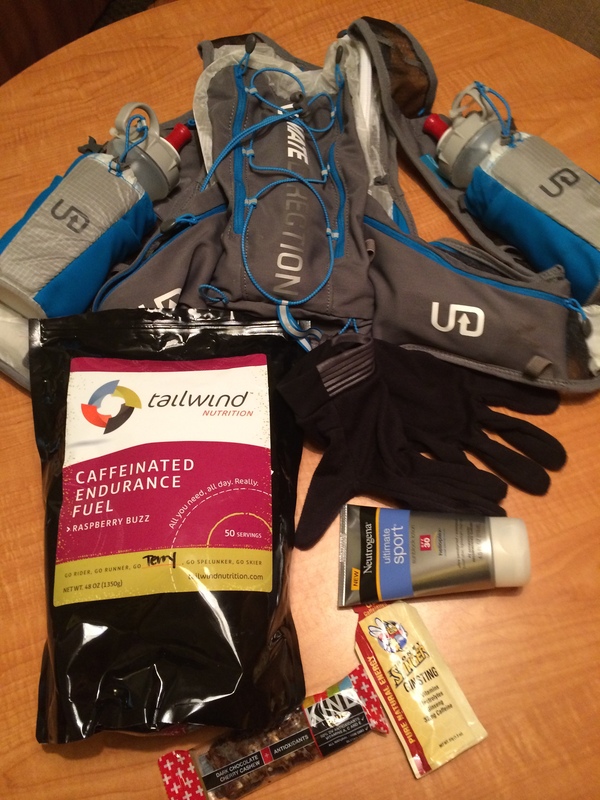 I am trying to run the course today with minimal aid station support – I only want to refill my water bottles, and I carry all the food I will need. Turns out this is not a great idea – the food looks pretty good at Hogan! Running into the Hogan aid station — the hub of the 55 km course. I end up visiting this aid station four times during the run. After a quick fill of my water bottles (and longing gazes at the food – I decide to stick to my plan, and eat a lemon wafer I am carrying), I start the second clover leaf, a relatively short 5 mile loop, almost all on a wonderful single track. 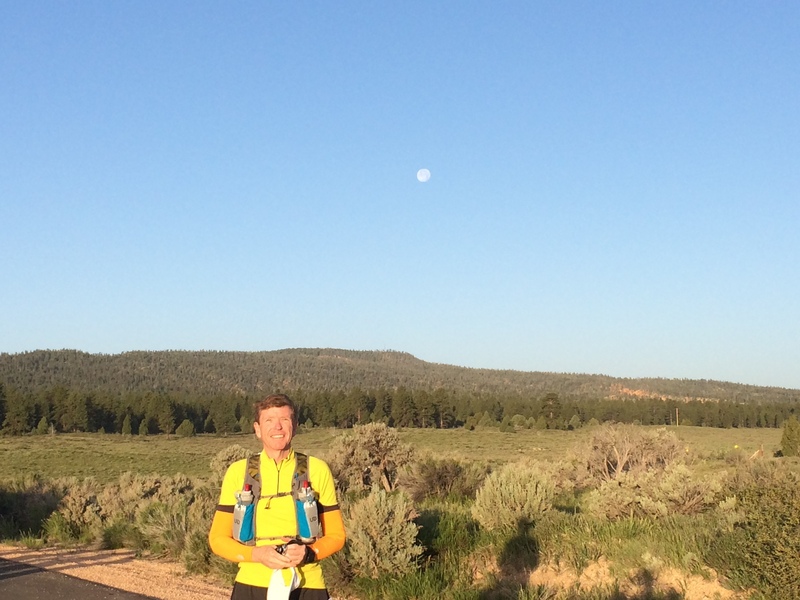 I roll back into the Hogan aid station at 2 hours (10.5 miles), and began a much longer loop towards Hunt’s Mesa. The first couple of miles are along the Valley road, and pretty easy. However, the course then begins to follow a very sandy trail/road route. I had hoped that the recent snowfall would have made the sand semi-compact and easier to run. Wrong. The fine grained sand does not hold moisture, and it is a leg burner! The course passes a series of slender monuments – the tallest of which is called the Totem. Standing in front of the Totem – a slender monument, about 14 miles into the run. I ponder the fate of the Totem; it is an inverted pendulum, and will eventually fall. 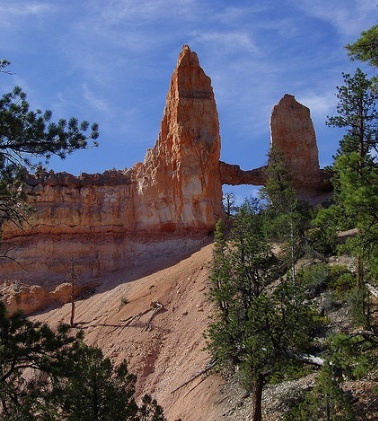 It is clear that there has not been any significant earthquake activity for a couple of thousand years near Monument Valley, or the precarious nature of Totem would most certainly have caused it to tumbled. I guess it will stand for a few thousand more years. Assuming there are ultra runners in a few more millennia, they will not experience the Totem. Miles 14-18 are sandy. The cliffs of the DeChelly sandstone are rounded by the abrasion from the winds. Today is a rare and fortunate day – little wind. The wind of Monument Valley picks up the fine gains of sand and silt that had eroded from the Permian sediments and slams them into the cliff faces. This constant assault eventually carves the rocks into bridges and arches. Wind is a very powerful erosion agent, and its effects are well represented in Monument Valley along the race course. I first was introduced to modeling saltation (the lifting of particles by bouncing along a surface) 35 years ago in graduate school. The route takes us to an amphitheater-arch call the “Big Hogan”. 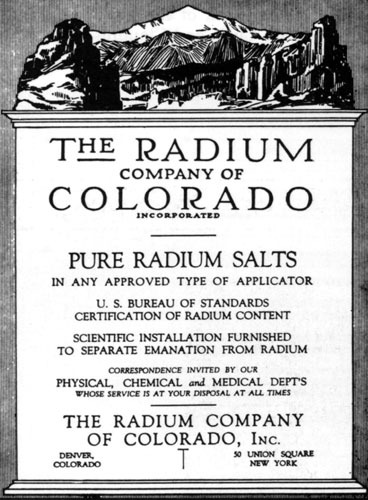 It is a wonderful example of the power of saltation. The wind has carved an amphitheater, and at the top has cut an arch – like the smoke hole in a hogan, hence the name. Approaching the Big Hogan – an amphitheater that has a small arch in its ceiling. Sandy running, but the scenery is great! The route eventually loops back to the Hogan aid station. The mileage for the third visit is almost exactly 20 miles. My time is 4 hrs and 6 minutes. A little slower than I planned, but considering the sand and all the time I took out to take pictures, I am pretty much on schedule. Once again, I look at the great selection of food laid out at the aid station and regret my stubborn dedication to minimal support. Out of the Hogan aid station the last loop is an out and back to the top of Mitchell Mesa — before me is the most difficult climb in the run. 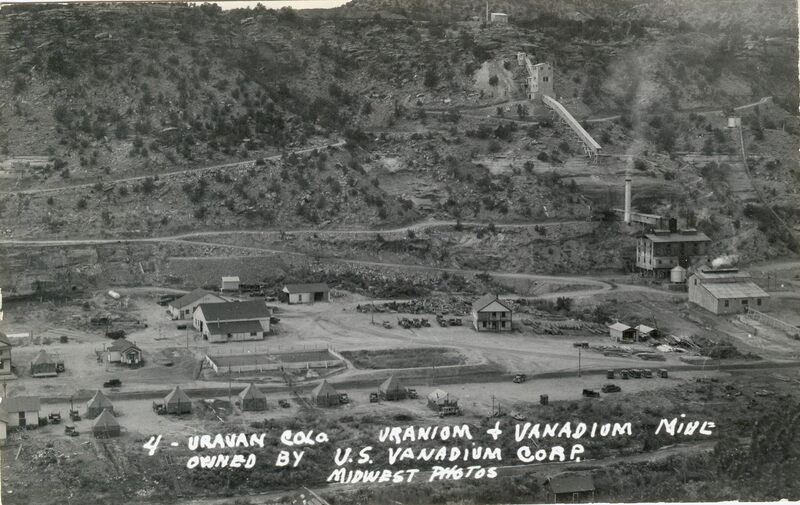 The trail leads west along a road cut to support a uranium mine on the the top of Mitchell Mesa back in the 1960s. 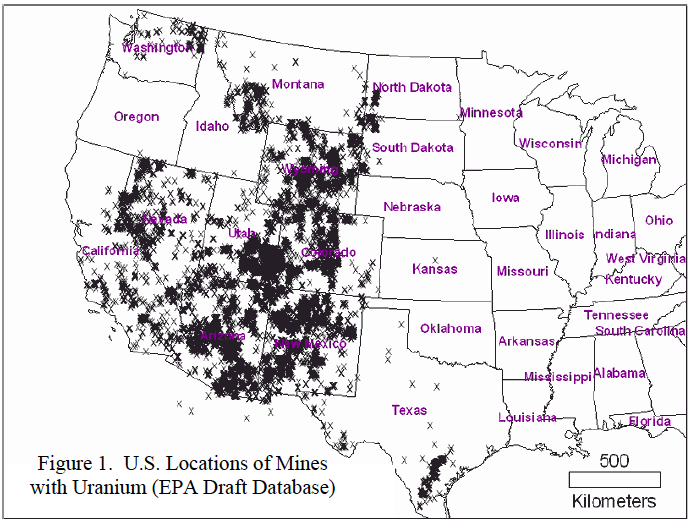 The location of Mitchell Mine, a uranium mine that operated between 1962 and 1965. 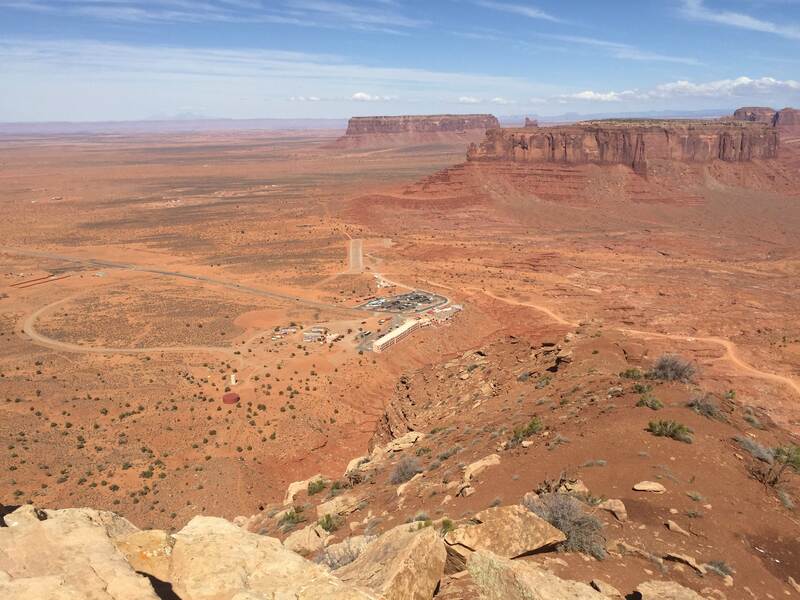 The last push of the Monument Valley utra is a climb up to the top of Mitchell Mesa on the road built to service the mine. 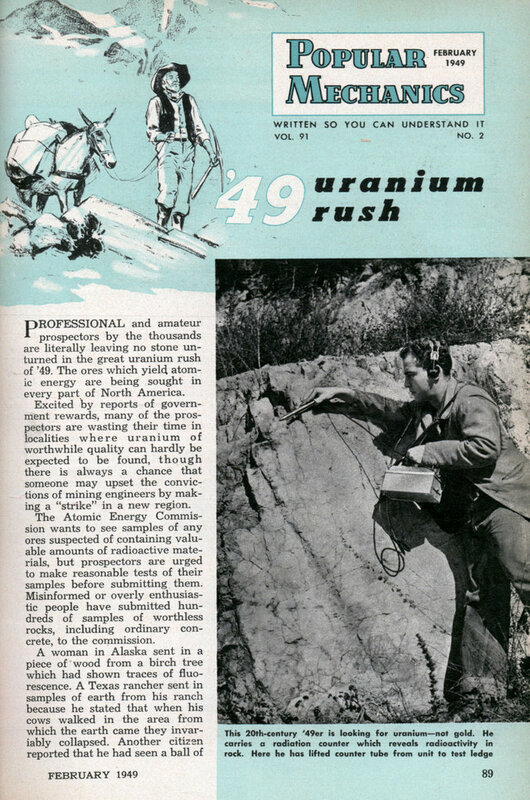 During the uranium frenzy of the 1950s, amateur and professional prospectors fanned out across the Colorado Plateau in search of the metal that fueled the nuclear age. 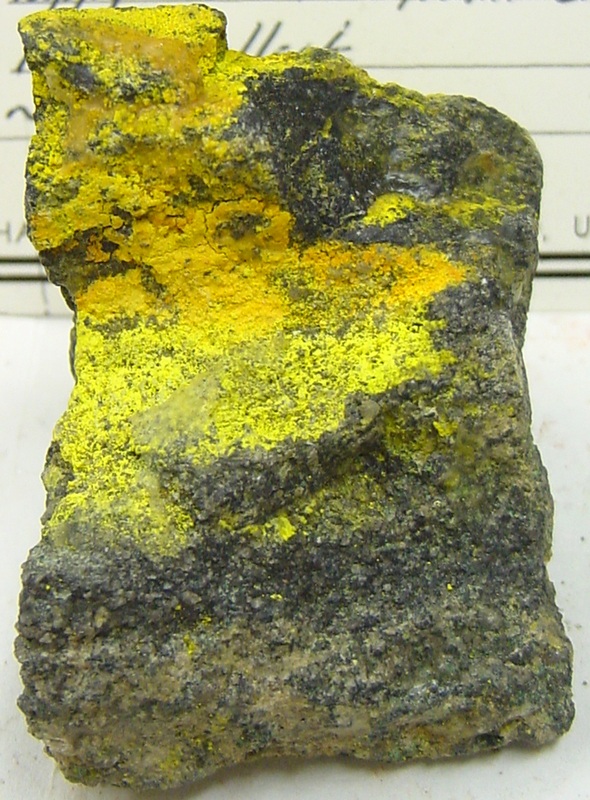 There are numerous small uranium deposits located in old river channels within the Shinarump formation. 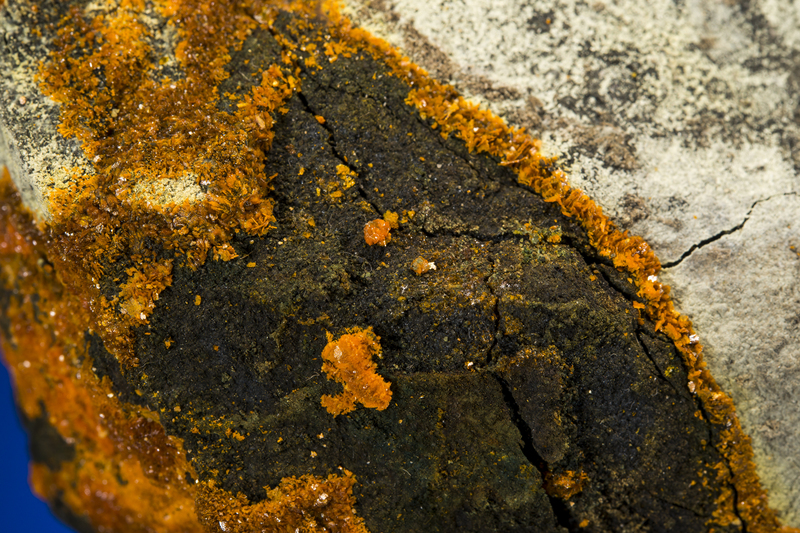 These old channels captured carbon debris – trees, branches, decomposing leaves, etc. 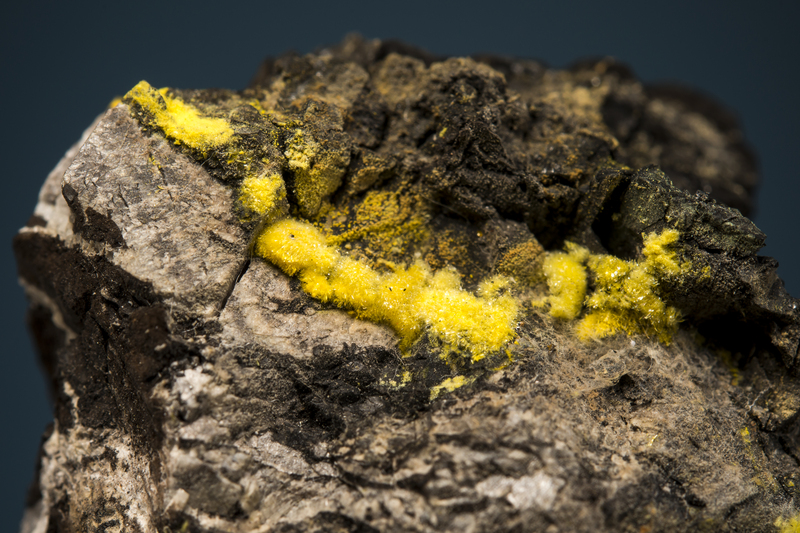 – which in turn served to precipitate uranium out of circulating ground waters. 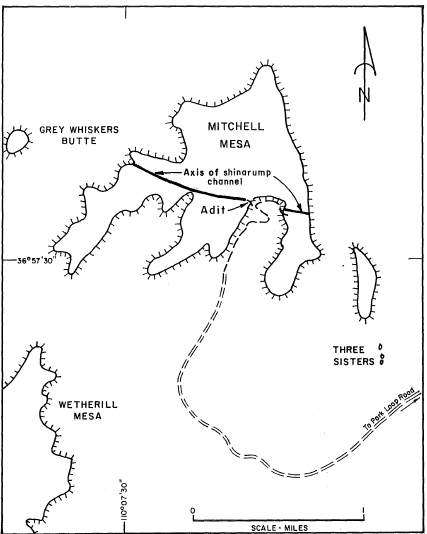 One of these ancient river channels cuts across Mitchell Mesa, and was mined briefly in the period 1962-1965. 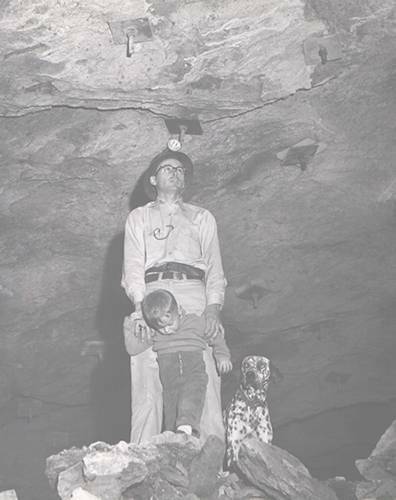 The mine’s operation came to an abrupt end when the operator, Robert Shiver, accidentally backed the ore hauler he was driving over a cliff, and tumbled more than 450 feet into the valley. 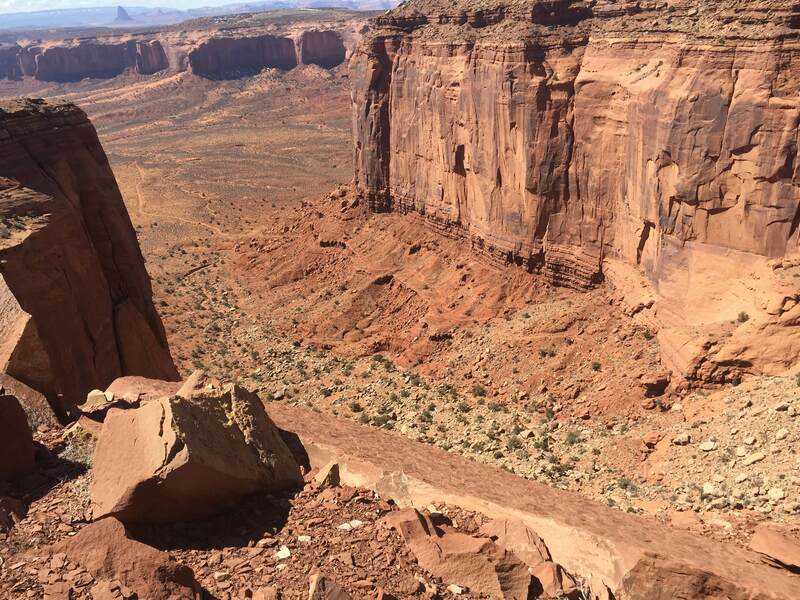 The same cliff that took Shiver’s life is the one that we have to climb to get to the top of Mitchell Mesa! 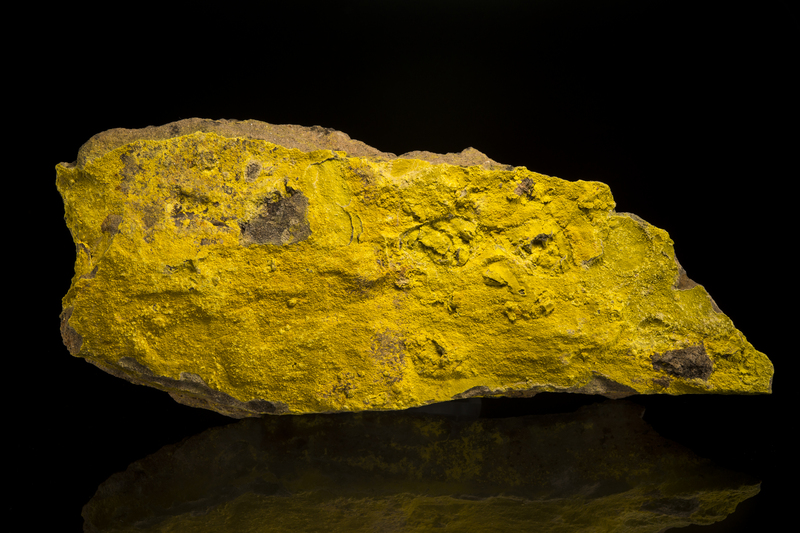 A sample of the uranium-vanadium mineral tyuyamunite from the Monument #2 mine – located across the valley from the Mitchell Mesa mine, and located in the same ancient river red. The tyuyamunite is replacing a log that had become stranded in the river channel. 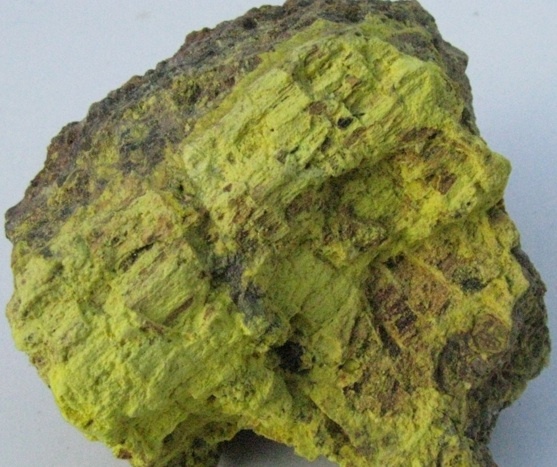 The ore from the mine on Mitchell Mesa was primarily Tyuyamunite – a rare uranium-vanadium oxide (chemical formula: Ca(UO2)2V2O8·(5-8)H2O). 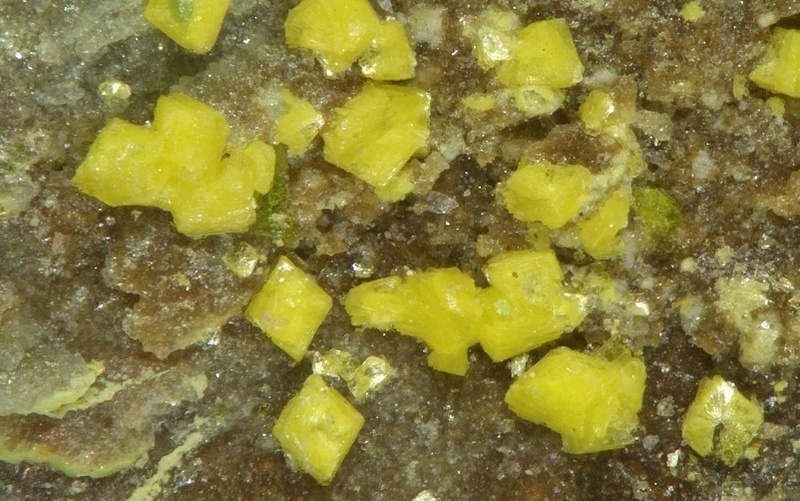 Like many uranium minerals it is colored canary yellow. 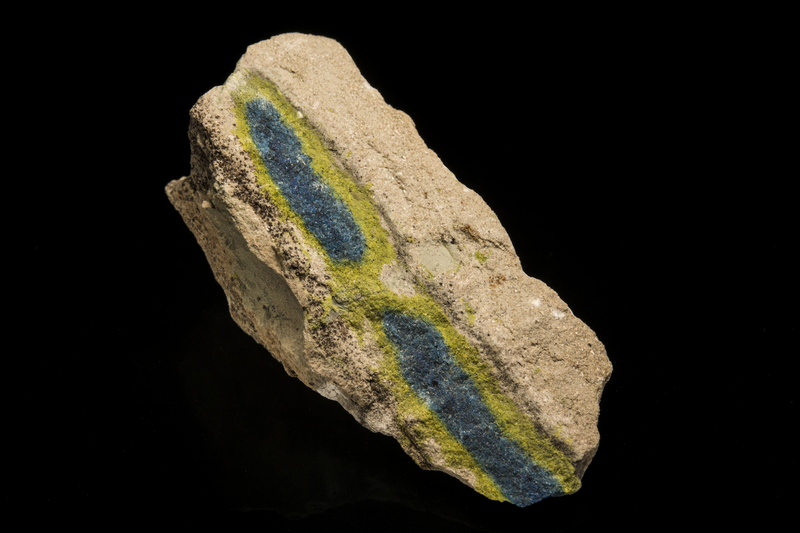 The picture above is a sample of Tyuyamunite that was found across the valley on Hunt’s Mesa. 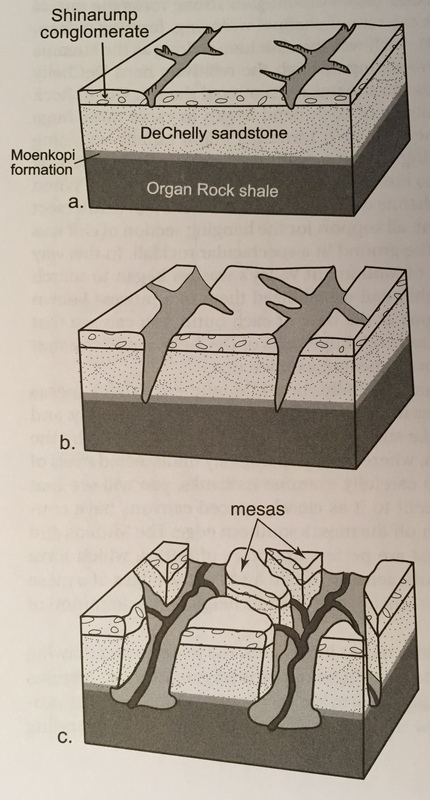 I don’t see any sign of mineralization as I grind my way up the mesa…. The climb really begins at mile 23; there is a rocky and relentless pitch that ascends 1200 feet in only a mile. I had visions that I would bound up the winding trail – wrong. It takes me 30 minutes to get to the top, and my quads are burning. Top of the climb up Mitchell Mesa, looking back at the narrow canyon that the trail runs up. You can see the faint track of the trail along the Organ Rock Shale in the center of the photo. It is hard to do the difficulty of the climb justice with a photo. 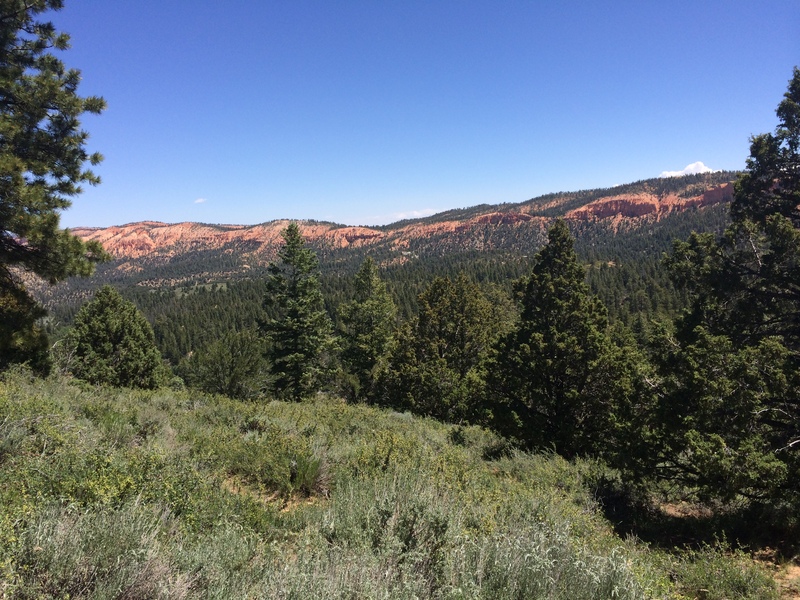 The run to the northern end of Mitchell Mesa is physically easy – but the views into the valley are breath taking, and I find myself drifting into tourist mode. Mitchell Mesa and Merrick Butte are named after a pair of prospectors that were murdered in the Valley in December, 1879. 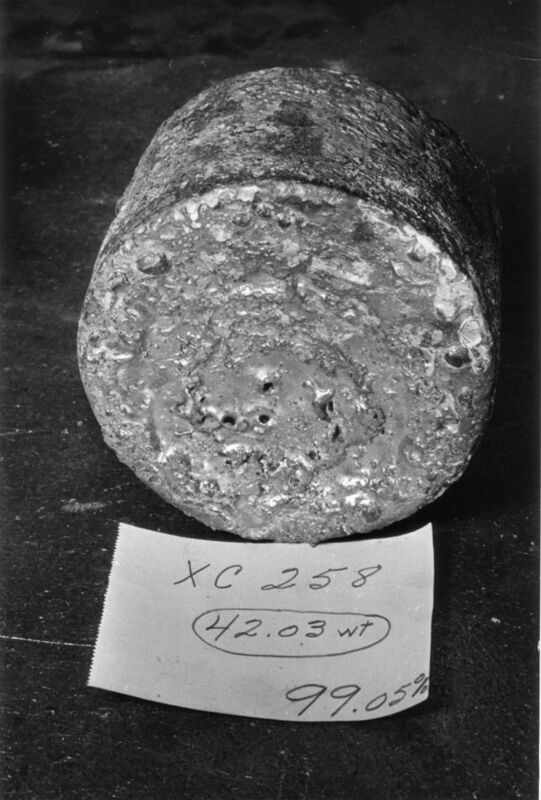 Charles Merrick had supposedly found three crude smelters built by Ute Indians to recover silver. 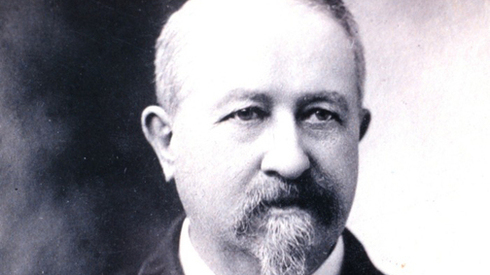 Merrick recruited Henry Mitchell to help him find the source of the silver; legend has it that they indeed did find a rich deposit, and the prospectors were heading home with ore samples when they met their untimely demise. 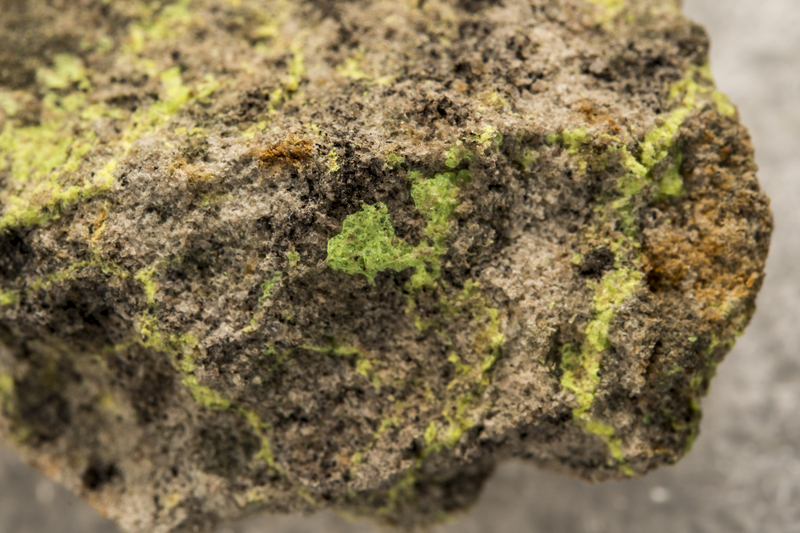 For years treasure hunters have searched for the lost Merrick-Mitchell mine, but it remains lost. West Mitten and Merrick Butte from the top of Mitchell Mesa. The views from the mesa are spectacular. The run along the top of the mesa is only about a mile long, but it is difficult after the long climb. There are patches of snow in the shade of trees, and I stop twice and fill my hat with a couple of handfuls of snow. It is now about 64 degrees (at least according to my weather app), and I am really overheated. The melting snow cools my hot head, and steels me for the last 9 miles of the run. The end of Mitchell Mesa and the turn around point, mile 25. The view looks down to the starting and ending point of the race – only about a mile away, and 1000 feet below. Unfortunately, I have to turn around, run a little under 9 more miles to get to the finish. The turn around point is the end of the Mesa. There is a hole punch that you apply to your bib, and turn around and retrace your steps back to the Hogan aid station. The view from the turn-around point is down to the finish line — so close, yet so far. I am pretty tired at this point, and my pace is slow. I pass lots of runners still making their way to the turn-around point, and I realize that although I have been pretty much running alone for hours, there are people that are going to finish several hours after I do. The descent off Mitchell Mesa is much more difficult than I expect – no springy legs hoping from rock to rock for me! I get to the Hogan aid station for the final time about 7 hours and 14 minutes. There is still a little less than four miles to go – argh. The last part of the run is completely along the Valley tour road. Unlike earlier in the morning, the road is now heavy with traffic. The speed limit is 15 miles per hour, and many of the cars and tour vans honor the limit, which minimizes the dust. However, every fourth or fifth car comes zooming by, and stirs up a chocking cloud of red dust. I really hate this part of the run, and curse at drivers that are obvious to the runner’s fate. The last two miles of the run are a steep climb back up to the lip of the cliff where the race started at dawn. I finish at 8 hours and 10 minutes by my watch – 40 minutes slower than I planned, but I am just happy to done! My watch says 33.5 miles, so it is just short of 55 km. Within a few minutes of rest I begin to think about how great the run was, and even the dust of the tail end begins to seem not so bad. A wonderful place to have a trail run. 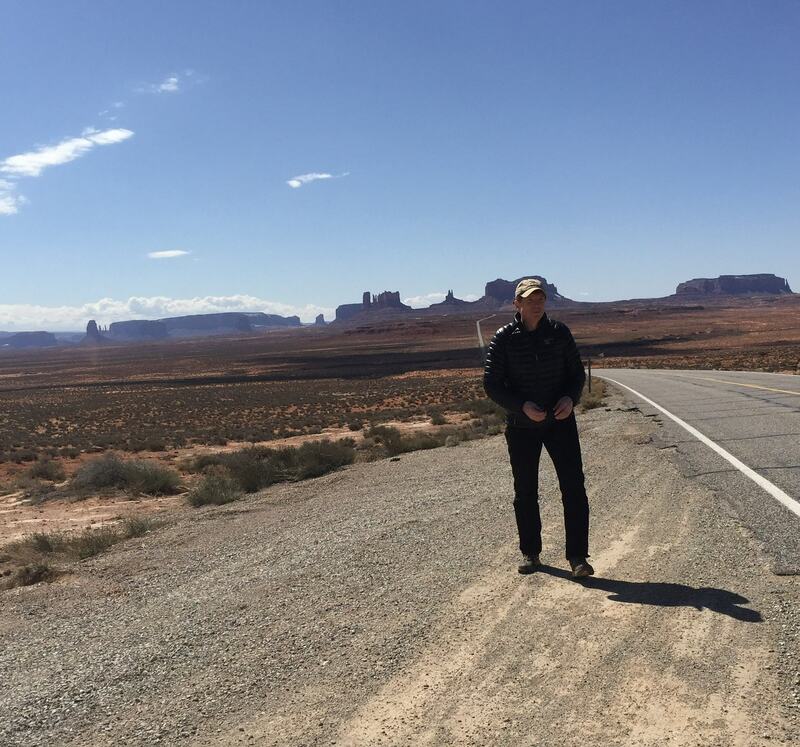 Homage to Gump: Standing near the point north of Monument Valley where Forrest Gump decided he had run enough. My Forrest Gump Moment I discovered trail running late in life. Not mountains, geology, the solitude of towering peaks and deep canyons – those have been with me since my earliest memories. But trail running is a too recent passion, but has allowed me to experience calm even as my muscles ache and I experience true exhaustion. I am not a competitive runner – oh sure, I wish I was fast, but my age and athletic ability preclude even the allusion of “competitive”. So, why run as hard as you can during an ultra run if you have no chance of being competitive? Because it is a grand challenge – ultra train races are hard, and pushing your limits are rewarded with the knowledge that you accomplished something difficult. That sounds a bit trite, but doing difficult things, accomplishing goals, are a reality check on realizing one’s potential. Like most everyone, I have much grander goals in life than just running long distances on dusty trails; I want to make a difference in the world, I want to discover, I want to make right. Those goals are pretty hard to evaluate except post-mortem, and once I am dead I don’t much care. But doing difficult things allows me to center; accomplishments are mileage posts along the way. This past January I had my annual physical (I will soon be 59). Once you pass the half century mark the ritual of the annual physical is aways approached with trepidation. Most American medial studies define “old age” as an onset of a plethora of symptoms, usually beginning sometime between 60 and 70 years. The most frightening of these symptoms is the decline of cognitive abilities – slowing down of the brain and gradual memory lose, for example. Everyone is different, and the decline is certainly a broad spectrum, but just as erosion will eventually wear down Mt. Everest to a nub, brains do wear out. So, at each annual check up I listen attentively to my doctor hoping to hear that I am amazingly young for “my age”. My check up in January started more or less as always – I have great heart function, good cholesterol, I seem to have good hearing except when my wife asks me to do something, still have most of my hair, etc. However, when the final part of my blood test was discussed my doctor said that my thyroid was pretty much kaput. I was diagnosed with hypothyroidism – an under active thyroid – a little over a decade ago. I have been taking levothroxin everyday for that decade. This is a synthetic hormone replacement; over the years my dose of levothroxin has been increased, so it was clear my thyroid was declining. I did not receive the news of “kaput” well – I was assured that this is okay, but I needed increase my medication, and monitor it closely. Hypothyroidism is not particularly rare – a few percent of Americans experience it, and both my parents had it. 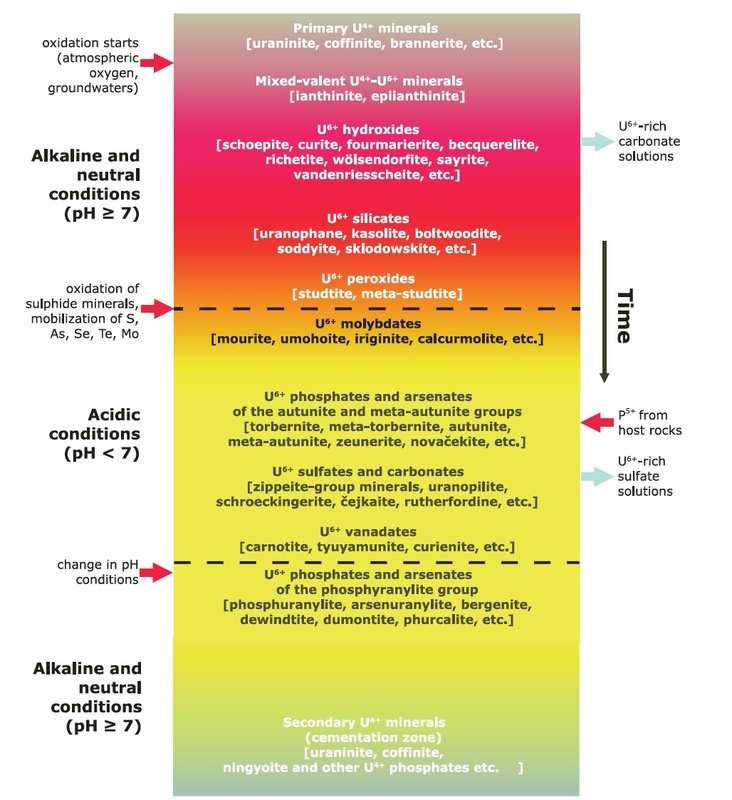 But it does have consequences – the thyroid helps regulate many functions in the body (including hair loss, which I appear to be immune to), but to athletes it is the key to fatigue, and to recovery from endurance events. In fact, there is a mini-scandal in world of endurance racers with the suggestion that some elite runners are using levothroxin to enhance performance. That has never been my case! But now I began to question if I would be able to truly run, bike or swim anymore. Was this the onset of old age for me? The Monument Valley ultra was my first race since my new medicine regime. As I lined up on the start line I could not help but wonder if I could actually do the race. However, I ran it just fine (well, my legs are not so sure it was just fine). Unlike Forrest Gump, I am not ready to stop running.